Ever since my people had moved into the area, centuries before, earthquakes had regularly added to their sorrows, devastating their towns at relatively brief intervals. The most recent, damaging earthquake had taken place in 1947. Some houses in Capistrano were damaged but there were no casualties. Other towns were damaged as well, but unlike previous strong earthquakes it had reaped few lives, having been only eight on the Mercalli Scale. But Calabria had not been that fortunate during previous earthquakes. In 1908 the area between Messina, Sicily and Reggio Calabria was hit by a devastating quake and an ensuing tsunami which devastated the area and killed between 60,000 and 120,000 people. I have not found any evidence that Capistrano was damaged during that period. On the other hand, on September 8, 1905, a strong earthquake struck Calabria from Cosenza, in northen Calabria, to Reggio, in the deepest south. The exact epicenter is not known, but it appears to have been somewhere between Vibo Valentia and Nicastro, in central Calabria, that is in my area. Over 600 people were killed and about 3000 were wounded. The city of Monteleone (today's Vibo Valentia) suffered significant damages. Parghelia, a town located about about 20 Km from Capistrano, on a straight line, was totally devastated. The terrifying event was described by a local student to a visiting news reporter. It is very descriptive of what happened in various towns in Central Calabria, including my town of Capistrano. It happened around 2:45 in the morning. Suddenly we were awakened by a horrendous roar. It seems as though all of hell had come upon our poor homes… Looking outside was futile as one could see nothing, given the dust that was rising from the ruins. The dust slowly settled and we were finally able to see each other’s faces; We were all outside on the road, some with a shirt on, some with only pants on; some were wrapped in a bedsheet and some fully naked were hiding in a corner trying to hide their nakedness. Meanwhile one could hear desperate cries, sobbings and people begging for help. In a corner a woman, almost naked, was yelling desperately, and she had undone her braids and she was covering her bare breasts with her hair. Another one…was digging through a mountain of ruins from which she said she could hear her daughter’s voice who was later found alive. Another one… was holding the dead body of one of her children. A poor old man was hanging from a window with his legs stuck inside. He was begging to be freed from death and, in fact, he did die. And there were a hundred more pitiful cases. The town of Monterosso Calabro, just about 2-3 Kms from Capistrano, on a straight line, also suffered great damage. Nello Manduca, a local historian, shares with us the details of that event in his book, Arsura. No doubt significant damages occurred also next door, in my town of Capistrano and surrounding towns. The number of casualties in my town is unknown. My townspeople must have been in a state of shock. The damage to people’s homes must have been significant. For certain, the experience must have been horrifying and unforgettable. Several large shack-like structures were hastily created to accommodate the surviving, homeless families. They lived in those primitive conditions for many years, until the government finally built decent and comfortable dwellings for them, decades later. The area where they were built is still called, “Le Baracche” (The Shacks), remembering the primitive dwellings where those poor, homeless families lived for many years. 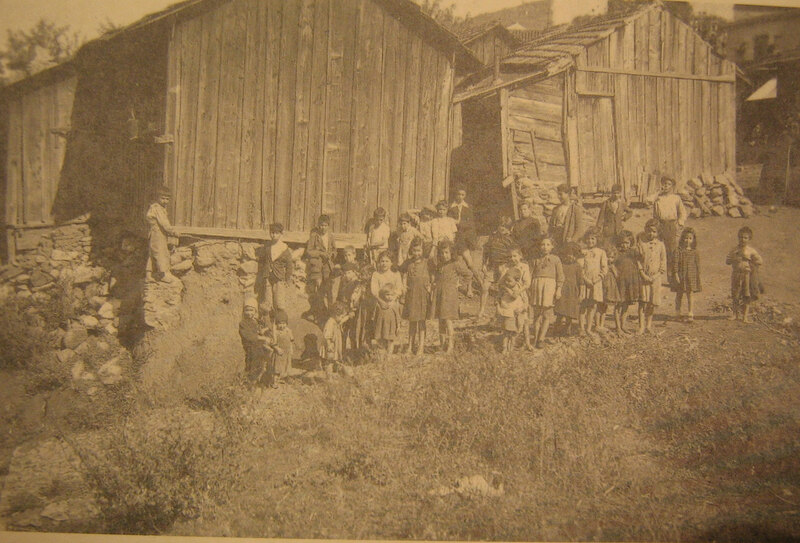 One of several shacks built for homeless families, after the 1905 earthquake, in the area still known as, "Le Baracche" (The Shacks). In this area people are dying of hunger and thirst…the help brought in with difficulty is not enough. The healthy need bread; the wounded need meat; water is missing, the dying need medical help…twenty thousand people have lost everything and do not even have containers to get water at the fountains. They are silent multitudes that cannot detach themselves from the ruins of their homes, where their beloved died and that dazed wait without strength for the help that never comes. Sant’Onofrio, another well known town in my area, was visited, not long after the earthquake, by the Italian King and Ferraris, one of his ministers. He was moved by the extent of the disaster and the traumatized crowds that surrounded him. “It’s horrible” he said later to his accompanying minister. Some women approached the King and said to him, “Your majesty, we lost everything; we no longer have a home, we have no possessions, we have no relatives. You only are left and God. Help us!” The King was deeply moved. During the month of November, 1894 a strong quake damaged Messina and Reggio Calabria and killed about 100 people, wounding about one thousand people and causing great damage. Pietro Colletta, a writer of the time, left us a vivid description of the catastrophic events of 1783.
Who can recount all the effects, and the phenomena and the new and strange things that afflicted us that we saw in that most miserable of times? They are without number, and filled with tears and beyond any human belief. Those quakes created by superior powers be it natural or unnatural,…in every way scourged the miserable earth. They brought down even the most solid of palaces; they cracked marble slabs and rocks of great sizes ... Nothing resisted them and the ground under our feet, swaying as the tempestuous sea, would not permit that humans would stay standing and fearfully pushed them back and forth. There was so much horror that each one supposed that the end of the world had come and that the earth, the water, and the rest of the heavens and of the ancient world would all mix together into chaos. The earth in many places opened up and created horrendous chasms. Other mountains united and covered the valleys between them. The rivers that flowed over them, having no longer any exit point created new and large lakes. Furthermore, new springs appeared as old ones dried up. The night of the fifth of February, the sea on the Scilla Coast became higher and fuller and, having risen to a shocking height, buried a great number of humans who had ran to take refuge by the sea. Many workers with their oxen and other animals where found large distances away from where they had been working, while others were swallowed up by chasms that opened suddenly. Many houses, many farms…traveled large distances and were found far away from their original location. Oh how many valiant men, how many beautiful women, how many handsome young people were oppressed by a sudden and miserable ruin. Oh how many superb buildings, how many temples, how many monasteries, which were the marvels of the world, were flattened to the ground. In another work titled, “Earthquakes in our Province” Serrao describes the horrors that befell the people of my area of Calabria. “The look of our Province in that such horrendous time was so miserable. One would see desolate and broken lands. One could hear the moans of those who were left under the ruins. Some ran and in running found their death. 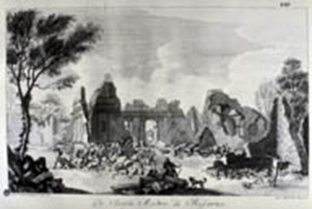 Unfortunately, in spite of the devastating effect the 1783 earthquakes had on Calabria, only a very few Calabrians know of their occurrence and dramatic impact. It's as if Calabrians chose to erase that dark period from their collective memory. Only now, with the advent of the Internet they are, on occasion, mentioned briefly in the history section of some Calabrian towns' web sites. Surprisingly, no monument exists, to my knowledge, anywhere in Calabria to commemorate the time when most of Calabria's past was erased and when its people had to start anew. Church in ruins, Rosarno, Calabria. Damaged building in Mileto, Calabria. 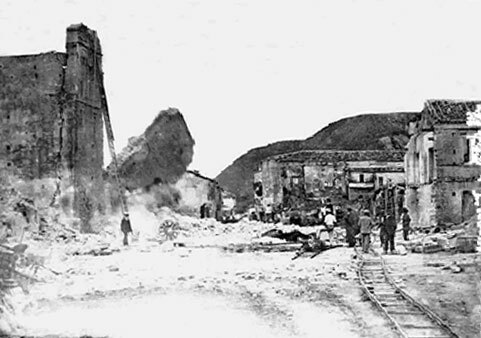 Oppido was totally destroyed and never rebuilt. The above Book, Historia De' Tremuoti (History of Earthquakes) by G. Vivenzio was Published in 1788. 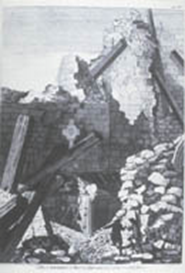 It details the damage caused by the 1873 earthquakes to affected Calabrian towns and cities. The above reproduction is found in the Vivenzio's book mentioned above . It testifies to the painful truth that Capistrano and the adjacent towns of Maierato, Montesanto, Panaja and Filogaso were totally destroyed. 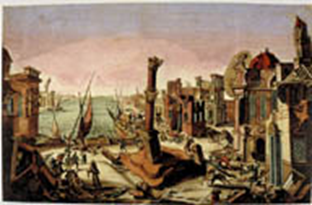 Though the 1783 earthquakes may have been the most cataclysmic to hit all of Calabria, previous earthquakes had been very violent as well. The earthquakes extended south into my area and all the way down into the southernmost province of Reggio Calabria. An esteemed Gesuit writer and scholar of the time, known as Father Athanasius Kircher, who was visiting Sicily and Calabria when the earthquakes struck, describes what he experienced in very descriptive and chilling language. Having hired a boat, in company with four more, (two friars of the order of St. Francis, and two seculars), we launched from the harbour of Messina, in Sicily; and arrived, the same day, at the promontory of Pelourus. Our destination was for the city of Euphaemia, in Calabria, where we had some business to transact, and where we designed to tarry for some time. (Author’s Note: Euphaemia, was located in the general area of the Lamezia Terme of today, about 30 km. on straight line from my town, where the Lamezia Airport is found). However, Providence seemed willing to cross our design; for we were obliged to continue three days at Pelorus, on account of the weather; and though we often put out to sea, yet were often driven back. At length, wearied with the delay, we resolved to prosecute our voyage; and, although the sea seemed more than usually agitated, we ventured forward. The gulf of Charybdis, which we approached, seemed whirled round in such a manner, as to form a vast hollow, merging to a point in the centre. Proceeding onward, and turning my eyes to Aetna, I saw it cast forth large volumes of smoke, of mountainous sizes, which entirely covered the island, and blotted out the shores from my view. This together with the dreadful noise, and the sulphurous stench which was strongly perceived, filled me with apprehensions, that some more dreadful calamity was impending. The sea itself seemed to wear a very unusual appearance: they who have seen a lake in a violent shower of rain, covered all over with bubbles, will conceive some idea of its agitations. My surprise was still increased, by the calmness and serenity of the weather; not a breeze, not a cloud, which might be supposed to put all nature thus into motion. I therefore warned my companions, that an earthquake was approaching; and, after some time, making for the shore with all possible diligence, we landed at Tropea, happy and thankful for having escaped that threatening dangers of the sea. But our triumphs at land were of short durations; for we had scarcely arrived at the Jesuits' College, in that city, when our ears were stunned with a horrid sound, resembling that of an infinite number of chariots, driven fiercely forward; the wheels rattling, and thongs cracking. Soon after this, a most dreadful earthquake ensued; the whole tract upon which we stood seemed to vibrate, as if we were in the scale of a balance that continued wavering. This motion, however, soon grew more violent; and being no longer able to keep my legs, I was thrown prostrate upon the ground. In the mean time, the universal ruin round me doubled my amazement. The crash of falling houses, the tottering of towers, and the groans of the dying, all contributed to raise my terror and despair. On every side of me, I saw nothing but a scene of ruin; and danger threatening wherever I should fly. I recommended myself to God, as my last great refuge. At the hour, O how vain was every sublunary happiness! Wealth, honour, empire, wisdom all mere useless sounds, and as empty as the bubbles of the deep! Just standing on the threshold of eternity, nothing but God was my pleasure; and the nearer I approached I only loved him the more. After some time, however finding that I remained unhurt, amidst the general concussion, I resolved to venture for safety; and running as fast as I could, I reached the shore, but almost terrified out of my reason. I did not search long here, till I found the boat in which I had landed, and my companions also, whose were terrors were even greater than mine. Our meeting was not of that kind, where every one is desirous of telling his own happy escape; it was all silence, and a gloomy dread of impending terrors. Leaving this seat of desolation, we prosecuted our voyage along the coast; and the next day came to Rochetta, where we landed, although the earth still continued in violent agitations. But we had scarcely arrived at our inn, when we were once more obliged to return to the boat; and, in about half an hour, we saw the greater part of the town, and the inn which we had put up, dashed to the ground, and burying the inhabitants beneath the ruins. In this manner, proceeding onward in our little vessel, finding no safety at land, and yet, from the smallness of our boat, having but a very dangerous continuance at sea, we were bound. Here, wherever I turned my eyes, nothing but scenes of ruin and horror appeared; towns and castles leveled to the ground; (Author’s note: This refers to the coastal centres on the coast very near my town). Stromboli, though at sixty miles distance, belching forth flames in an unusual manner, and with a noise which I could distinctly hear. But my attention was quickly turned from more remote, to contiguous danger. The rumbling sound of an approaching earthquake, which we by this time were grown acquainted with, alarmed us for the consequences; it every moment seemed to grow louder, and to approach nearer. The place on which we stood now began to shake most dreadfully: so that being unable to stand, my companions and I caught hold of whatever shrub grew next to us, and supported ourselves in that manner. After some time, this violent paroxysm ceasing, we again stood up, in order to prosecute our voyage to Euphaemia, which lay within sight. In the mean time, while we were preparing for this purpose, I turned my eyes toward the city, but could see only a frightful dark cloud, that seemed to rest upon the place.This the more surprised us, as the weather was so very serene. We waited, therefore, till the cloud had passed away: then turning to look for the city it was totally sunk. Wonderful to tell! Nothing but a dismal and putrid lake was seen where it stood. We looked about to find some one that could tell us of its sad catastrophe, but could see no person. All was become a melancholy solitude; a scene of hideous desolation. Thus proceeding pensively along, in quest of some human being that could give us a little information, we at length saw a boy sitting by the shore, and appearing stupefied with terror. Of him, therefore, we inquired concerning the fate of the city; but he could not be prevailed on to give us an answer. We entreated him, with every expression of tenderness and pity, to tell us; but his senses were quite wrapped up in the contemplation of the danger he had escaped. We offered him some victuals, but he seemed to loath the sight. We still persisted in our offices of kindness; but he only pointed to the place of the city, like one out of his senses; and then running up into the woods, was never heard of after. Such was the fate of the city of Euphaemia. Kircher describes Aeuphemia as having sunk and having been replaced by a lake. That was an assumption based on what he saw. In reality we now know that the town had been destroyed by an unforgiving tsunami that buried the town and an unknown number of its inhabitants. The people who survived moved more inland and built another city on a nearby hill and named it Saint Eufemia. Today the city has joined together with Sembiase and Nicastro to create the new, prosperous airport city of Lamezia Terme. The layers before the 1600’s are vague and the details more sparse. We do know that the town of Castel Monardo, very close to Capistrano, was destroyed three times before the 1500’s and that great damage was also caused in that town in 1184.33 We can safely assume that the same fate befell Capistrano and nearby towns and probably most, or all of Calabria, as well. 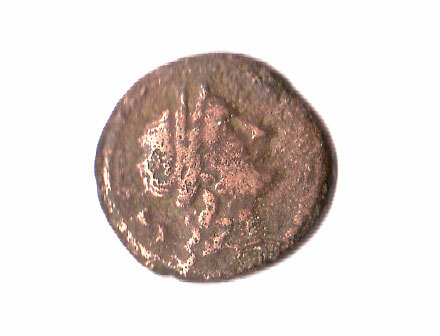 No doubt many more earthquakes leveled the villages in the area during the first millennium AD. I have not yet been able to find any records of those traumatic events. These unstoppable, tragic events have done much to shape the mental set of Calabrians. There is an unconscious belief in many Calabrians that nothing is really solid; nothing is there to last. A lingering anxiety resides in the mind of many my people that prevents total peace from being experienced and that steals from them the tranquility they so much need and crave. Unfortunately, this belief is grounded on centuries of evidence which point to an inevitable reality: the future has in store more painful times for my people. Earthquakes are not just a part of their past -- they are an inevitable part of their future and they must accept this painful challenge with total determination so as to make sure that future damage will be as limited as possible. This can be accomplished by imposing stringent building codes and by educating young and old on how to survive, if and when another series of powerful quakes will hit our beloved Region.